In case you haven’t noticed, there are bike share programs all over Vancouver. You know what I mean – racks of bikes that all look the same, neatly lined up and looking ever so tempting to jump on and ride. Bike-sharing is now spreading to the burbs. A couple of weekends ago my kids and I were at Rocky Point in Port Moody when we spotted our first a bicycle rental place in the burbs. Unlike the bike share/rental racks in Vancouver where the bikes are neatly lined up in racks, the U-Bicycle rental place had six or eight bikes clustered around a small rack. To be honest it didn’t look very tidy or organized. Which brings me to the kind of weird phenomena that is spreading just as fast as the bike and scooter sharing concept spreads – people picking up bikes or scooters from the “share station” and throwing them in nearby bodies of water. Weird. Anyway, about the Rocky Point U-Bicycle rental, my daughter and I decided that we wanted to test out the rental bikes. So we went over to them, scanned the QR code and tried to use the bike. Nope. You have to first download the app. Seeing as there was no Wi-Fi nearby, I couldn’t download the app. So I waited until I got home and then downloaded the app. Once I had the app on my phone, there’s still a little bit of information you need to fill out in order to register in order to use the bike share program. It wasn’t as quick and simple as I had assumed it would be. However, let’s be honest, it was not onerous. Once you do register for the bike share program, you have to pay a $50 deposit. Thankfully they do accept PayPal as a payment option. I am unclear how I can get my deposit back – or if I can. Simply registering provides the first time rider/renter with two hours of free riding. However I then found out that you can only rent one bike at a time! I wanted to rent two bikes so that my daughter and I could go for a bicycle ride but nope. The app only allows the rental of one bike. We got around that by loading my daughters bike into our car and going to Rocky Point where we rented the one U-Bicycle rental bike. When you rent a bike, you need to realize that this is not a high-end bicycle. It is a very basic, comfortable ride. However, the tires are very hard. I think, if I’m not mistaken, they are actually solid rubber tires. This is great to keep you from getting flat tires and makes the maintenance cost of the bikes lower. But yikes, that is a pretty stiff ride. The U-Bicycle rentals are basic three speed bikes with a grip shifter that allows easy shifting with the twist of the wrist. Click-click-click to change from 1st to 2nd to 3rd. The shifting was smooth and easy to do. On the left-hand grip is a bell which you can ring. It is loud enough to be quite effective at alerting the walkers you encounter. Loud enough when you’re on crowded or busy paths. As you can see in the picture, the bikes are step through models. The seat with height was easy to adjust and so I stopped and lowered the seat right down and let my daughter ride the bike. She got quite a thrill out of riding the rental bike. Thinking about the entire experience, it was relatively easy to use the app. Scan the QR code located on the back of the bike, click the “unlock” button and the bike was ready to ride. Once we were done riding, we returned to the parking spot where the bikes are kept, scanned the QR code again, clicked the “end ride” button and the lock on the rear wheel returns to the locked position. The ride is over. Overall, it was a fun experience. Kind of a novelty to rent a bike. 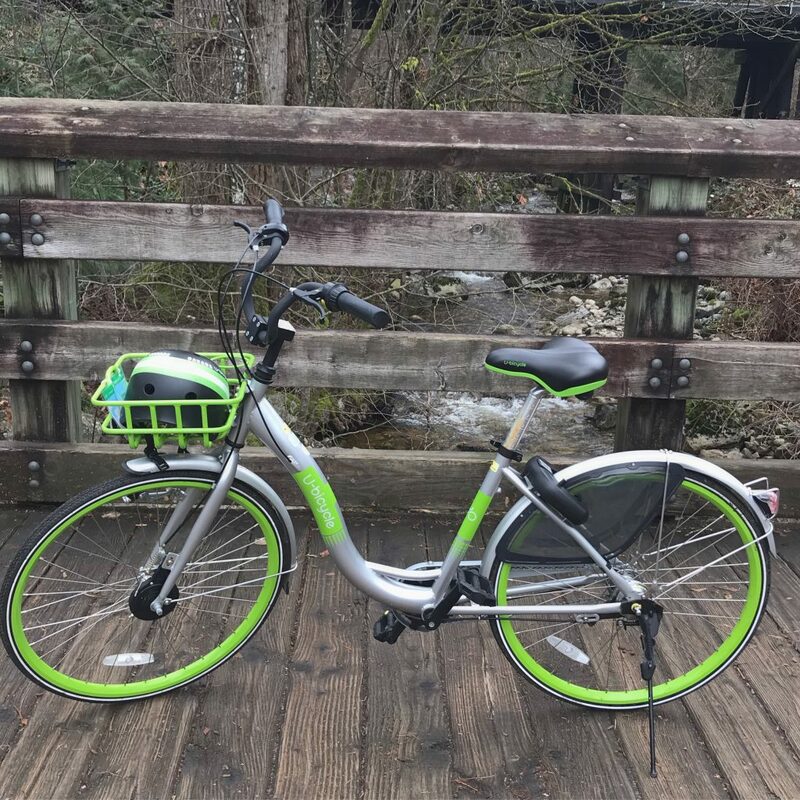 I’m not sure that I would rent a bike again but, that being said I do know that I will be in Victoria this spring and U-Bicycle has rental bikes there so it might be a fun way to tour around the inner Harbour in the city a little bit.